As The Legal Genealogist prepares for the Federation of Genealogical Society cruise to Alaska starting later this week, it’s clear that folks with roots in Alaska sometimes think that there are some amazingly strong parallels between the laws of Oregon and their own laws there in the Last Frontier. Every time you look at, say, one of the early laws of Alaska as to justices of the peace, you might think that it seems to be identical or very nearly identical to the law in effect on the same such in Oregon. At that point, Alaska became American territory — and essentially lawless. 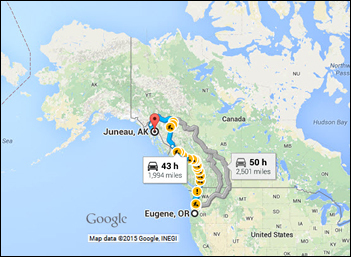 Even today, two days by fast car away from Alaska and its capital. Whatever the justification, Oregon law became the law of Alaska. But any changes adopted by Oregon weren’t included. And Alaska law continued to develop after 1884. What had been Washington Territory was admitted as the 42nd state in 1889. In 1884, Oregon was the nearest state. Washington had composed a “Washington State” Constitution in 1878, but it wasn’t officially adopted, so it looks as if the nearest state with an official set of laws available to adopt was Oregon. That’s as good an explanation as any, but again there’s no documentation for any explanation of why! Having been born and raised in Alaska and being a resident of Washington for most of my life, I will venture a guess that Oregon was chosen because it was the closest state (Washington did not become a state until November 11, 1889). That’s most likely the case, Miriam — but there’s no specific evidence for it. Walter Borneman’s “Alaska: Saga of a Bold Land,” 2003, is the best-documented book I’ve found so far on the pre-history and history of Alaska. He claims that after the purchase from the Russians in 1867 what is now Alaska was officially governed by first the US Army, and then the Navy, with considerable assist from missionaries, who divided up the huge area among them, taking responsibility not just for religious affairs but for education. Pres. Benjamin Harrison’s Organic Act of 1884 called Alaska a “district,” not a “territory,” because the latter would have implied Alaska was headed toward statehood. Neither Harrison nor Congress had any intention of statehood, because of the small population. The Organic Act also did not provide citizenship to the Native Americans, made no provision for law enforcement, and forbade a legislature. Borneman doesn’t speak to the issue of land law, at least not in the section on the Organic Act of 1884. So while the Act stated that the laws were those of Oregon Territory, they were definitely not a carbon copy. This is from pgs. 102-130. At that point, Washington Territory went from the Pacific to the Continental Divide, taking in what are now the states of Idaho, part of Montana, and some of Nevada, and Wyoming, if memory serves. Its population was, like that of Alaska, minimal, except for Vancouver, across the Columbia River from Portland, Oregon, Walla Walla, in Eastern Washington, and the growing Puget Sound cities of Seattle and Tacoma. Washington Territory still followed the laws of Oregon Territory, more or less, though it wasn’t long–1889–before it attained statehood. I too would assume that the lack of statehood for Washington is the reason Oregon was used as the model. The other thing Borneman states is that Congress wanted to get things organized in a hurry (some things never change) so they picked Oregon’s already-existing laws, and the fact that they were the closest to Alaska. The “getting things organized in a hurry” part is fairly well-documented. The choice of Oregon — not.